Creating an artistic look with a photo can be as easy as using a filter or plug-in for Photoshop, Elements or Lightroom. 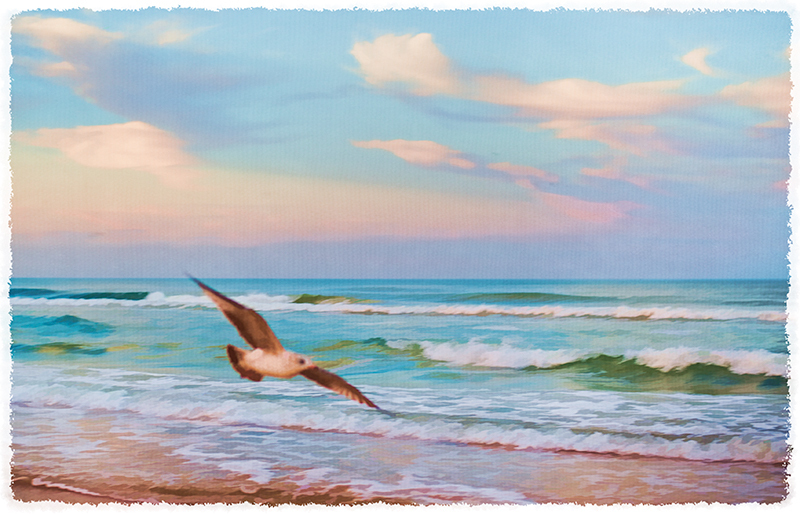 With this seagull and beach scene, I used Topaz Labs Simplify, a very creative plug-in for creating brushstrokes of color. Simplify removes some of the detail, which in turn creates a more artistic image. 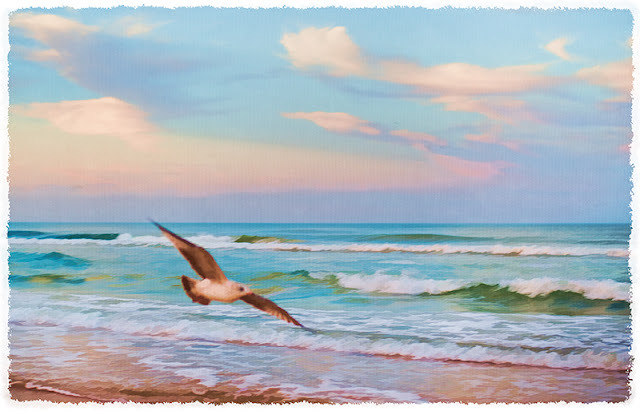 The colors can be accentuated as shown with the seagull photo above. There are quite a few presets for Simplify; BuzzSim, cartoon, various painterly looks, color sketch, underpainting which is great for creating a base to further paint an image, woodcarving and more! With the seagull image, I used BuzzSim which is one of my favorites of the Simplify presets. This preset removes some of the detail and softens the image, accentuating the overall colors. Removing some of the detail creates a more tranquil look which works nicely for this beach scene subject matter. I like the pastel look the preset created, just the idea I had in mind for this image! To enhance the artistic look, you can use a canvas background to create a little texture. Try using one of the textures found in Patterns in Photoshop (Artist's Surfaces) and use a Blend Mode to blend the two, such as Overlay or Multiply. You can also use your own texture, my favorites are from Flypaper Textures! As a finishing touch, I used an edge treatment from OnOne Photoframe that resembles canvas and brushstrokes. All links and promotional codes to software can be found by clicking on my Plug-in page.